Alfred and Adam have been given a mission to bring a star witness from the Riviera to London to testify in a murder trial. Before they leave Le Havre on their way to Paris, they are beset by anarchists and Fenchurch’s beloved Lancia Lambda is blown to smithereens. Inspector Alfred Fenchurch and his sidekick, PC Adam Cowley, were both born on the island of Jersey. They work for the Bristol Constabulary when not answering the call from Fulshard, the head of a special Anglo-French law enforcement unit. Inspector Alfred Fenchurch is part-English and part-French, obsessed with the metaphysical poets, Italian sports cars, and owns a house in Le Havre. Adam Cowley is Alfred’s one time childhood friend now devoted lover, never the stooge. 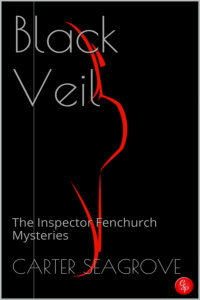 Black Veil is the second Inspector Fenchurch Mystery and follows on from the first story in the Fenchurch series, The Blakely Affair.